Here is our classic Amish made TV console, without the optional audio cabinet - the perfect way to display your TV in style, and at a price you can afford. The classic TV console is an excellent way for someone who doesn’t need a full-blown entertainment center to have the beauty and quality of Amish furniture in their home. 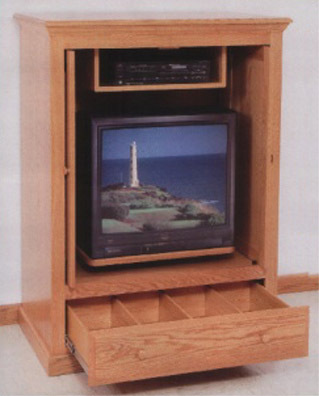 Shown here in solid oak, it features a pair of pocket doors to cover the TV/VCR space, swivel platform for the TV, a spacious drawer at the bottom, with handy tape dividers, and a VCR box inside the main cabinet. The top features a decorative moulding that matches a line of matching bookshelves that we have available.